Former U.S. ambassador to the U.N. John Bolton speaks during the 2013 NRA Annual Meeting in Houston, the same year he recorded a promotional video for a Russian gun rights group with ties to the NRA. Incoming White House national security adviser John Bolton recorded a video used by the Russian gun rights group The Right to Bear Arms in 2013 to encourage the Russian government to loosen gun laws. The episode, which has not been previously reported, illustrates the common cause that Russian and American gun rights groups were forming in the years leading up to the 2016 election through former National Rifle Association President David Keene. Keene appointed Bolton to the NRA's international affairs subcommittee in 2011. Russian politician Alexander Torshin helped establish The Right to Bear Arms and cultivate ties with American gun rights groups including the NRA. As a Putin ally, Torshin served as the deputy speaker of Russia's parliament for more than a decade and also spent time on Russia's National Anti-Terrorism Committee, a state body that includes the director of Russia's internal security service. The Bolton video appears to be another plank in a bridge built by Russia to conservative political organizations inside the United States. It's unclear why Russian leaders wanted to curry favor with the NRA, but Torshin and Keene appeared to have developed close ties in the years prior to the 2016 election. It's a relationship that has outsize importance now that the FBI is reportedly investigating whether Torshin illegally funneled money to the NRA to assist the Trump campaign in 2016, as McClatchy reported in January. The NRA has denied wrongdoing. 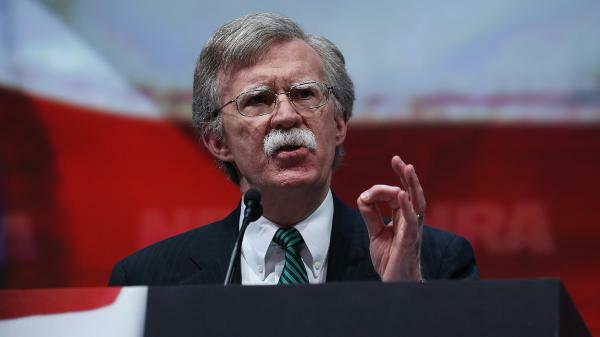 President Trump announced Thursday evening that Bolton, a former ambassador to the United Nations, would be his pick to replace national security adviser H.R. McMaster and that the transition would happen on April 9. Bolton was spotted at the White House earlier Thursday and also visited Trump in the Oval Office earlier this month. Bolton is a curious pick for The Right to Bear Arms in its video effort to influence the Russian legislature. After all, he is one of the most hawkish, anti-Russia figures in Republican Party foreign policy circles. And yet the video recorded by Bolton was used by this obscure Russian gun rights group with ties to the Kremlin. A source close to Bolton told NPR that he was originally asked to record the video by Keene, who served as NRA president from 2011 to 2013, and that he was informed the recording was for the Russian legislature. The source also said the former ambassador had never heard of The Right to Bear Arms until recent news coverage of the group. Russian gun laws are relatively strict, and there is no fundamental right to own a gun. In the video, Bolton urges the Russian people to adopt gun rights as part of their constitution — in much the same way that the United States has a Second Amendment. At the time, he was a member of the NRA's international affairs subcommittee, a position Keene had appointed him to. The two have known each other since 1972, when Bolton interned for Keene. "Thank you for this opportunity to address the Russian people on the 20th anniversary of the adoption of the Russian Constitution," Bolton said in the video, which has previously been unreported. "Were the Russian national government to grant a broader right to bear arms to its people, it would be creating a partnership with its citizens that would better allow for the protection of mothers, children and families without in any way compromising the integrity of the Russian state. That is my wish and my advice to your great people." Keene is a central player in the links between the American and Russian gun rights movements, and fall 2013 was a key moment in the development of this relationship. A few days before Bolton's video was posted online, in November 2013, Keene was in Moscow for The Right to Bear Arms annual conference, delivering a speech. More than 300 gun rights advocates across the globe gathered in an upscale hotel to hear arguments for loosening of gun rights. There was even a concealed-carry-fashion show. There were signs that the Russian government had given its approval that the conference take place. Russian politicians, such as Torshin, were present, made speeches and were presented with honorary memberships to The Right to Bear Arms. "One would have to make an assumption that in Russia, which is a fairly closed society, that if someone was doing this, the government wasn't upset by it and knew what was going on," said conference attendee Alan Gottlieb, the founder of the U.S.-based Second Amendment Foundation. "The feeling was that it was sanctioned by the powers that be, so to speak. Otherwise, I would have doubted if it were to have taken place." Gary Burris, another attendee, recalled "two or three high-ranking government officials there" who represented the Russian legislature. "They were people who had some political sway." Bolton was not present at this conference. But the issue the former ambassador raised in his 2013 video — changing the Russian Constitution to guarantee gun rights — was a major theme. "Amending the Russian Constitution to include a right to keep and bear arms provision, like our Second Amendment, was definitely a high priority for the attendees at the conference," Gottlieb told NPR. At the conference, Keene said that it was a "great honor to be here today, partly because over the course of the last three years, I've hosted your senator Alexander Torshin at the National Rifle Association's annual meetings." Torshin regularly tweeted and posted photos of his visits with Keene over the years. Keene had once reciprocated and posted a photo of Torshin on his personal website. But with the report of an FBI investigation, as well as a preliminary inquiry into the NRA, times have changed — that photo was removed from Keene's website. However, he did not delete the reference from his Facebook page, where it remains. Neither Torshin nor Keene responded to multiple requests for comment.